SeaMonkey 1.1.8, the Mozilla Foundation’s all-in-one Internet application, combines browsing, e-mail, HTML editing, and IRC chat. The project traces its lineage to the classic Netscape Communicator suite—but unfortunately, those roots show a little too clearly. SeaMonkey’s browser is by far its best component, boasting the most accurate rendering of any Gecko-based browser I tested. It flawlessly displayed tricky code that foiled its siblings, including all the browser-busting examples at CSS Edge. The worst glitch I saw in my testing involved some slight flickering in the QuickLook windows at Gap.com. On average, SeaMonkey also rendered pages slightly faster than Firefox. It even offers drag-and-drop tabs, though it can’t open multiple tabs from a folder of bookmarks. SeaMonkey’s mail program borrows code from Mozilla’s Thunderbird, including junk-mail filtering. Sending and receiving messages worked fine for the mail account provided by my ISP, but SeaMonkey wouldn’t accept the SMTP data necessary to work with Gmail. SeaMonkey’s mail has no OS X integration, relying on its own address book instead of OS X’s built-in Address Book. And if you want to import mail into SeaMonkey from another application, you’re limited to Outlook, Outlook Express, or Eudora. A complicated, outdated interface makes SeaMonkey feel like a bad trip back in time. The application’s Composer HTML-editing module for writing Web pages seems similarly archaic. A Layers button offers limited support for some aspects of CSS style and positioning, but if you want to edit CSS stylesheets, you’ll have to code them by hand. ChatZilla, the included Internet Relay Chat client, handles IRC chats well, but it’s also available as an add-on for Firefox. 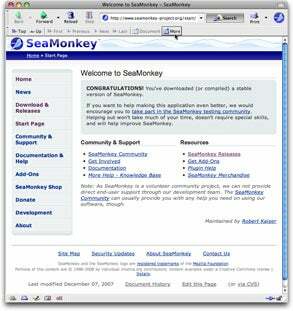 SeaMonkey’s two default themes regrettably imitate browsers five to ten years behind the times. In the resulting gray, boxy confines, even its excellent browser feels like a chore to use. Mozilla’s site offers a few other themes, but most wouldn’t install, due to problems with their installation scripts. Several add-ons for SeaMonkey installed successfully, but none seemed to work, even after the program restarted. Instead of cooperating in a clean, one-window interface, each SeaMonkey tool opens in a separate window. The Preferences pane is a dense mess of hierarchical menus, and the Help window is oddly buggy. You can’t open Preferences while the Help window is open, and attempts to click on the browser window behind it caused the browser to snap to the Help window’s position—or, in some cases, partly vanish off the top of the screen. SeaMonkey’s project coordinator says that the program’s volunteer coders are working on a host of improvements for version 2, scheduled for release later this year. Until those improvements materialize, SeaMonkey 1.1.8 feels like a great browser saddled with so-so add-ons, and trapped beneath an oppressive interface.